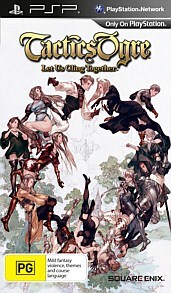 Tactics Ogre : Let’s Cling Together is a PSP adaptation of a 1995 Super Nintendo/Super Famicom game of the same name. It has been re-released several times on different platforms, but even after 15 years, the game is quite a delight to play, only hampered slightly by an outdated interface. The compelling, intricate storyline involves three ethnic groups, all vying for the control of Valeria. You are Denam, part of the oppressed Walister group. Having watched your home town being massacred and your father taken away, you group with your childhood friend Vyce and your sister Catiua as you play a pivotal role in getting peace for Walister (and control of Valeria, if yo so wish). The branching plot itself is a feat indeed, reliant on making difficult moral decisions. Will you join in a massacre of your own people if it may help ensuring peace for Walister? Will you join your friends, even if you don’t believe in their methods? Will you make peace with your former enemies? These decisions change the different battles you have to face and make you feel like you are in control. 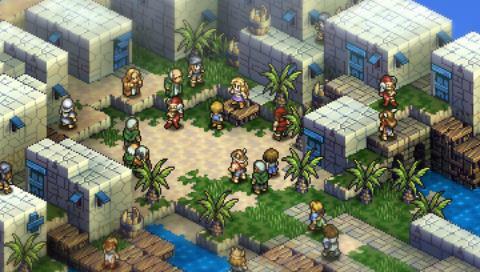 The dialogue is great as is the expressive music – it’s amazing what they have been able to do with such small sprites. The battles themselves are standard SRPG fare, not that that is anything to sneeze at. You lead up to 10 different characters on an isometric map, each map having an objective (Kill someone or vanquish all enemies). The battles themselves are exciting, as you have a whole lot of different tactics and strategies to play with. There are loads of classes and each character can be assigned up to 10 skills, which means that you can seriously deck out your character just the way you like it. (Skills may mean proficiencies with weapons, magic or class-specific actions). The depth of character configuration leads to me the overall depth of the game. By pressing the “select” button, you can get information on each bit of data on-screen. And there is a lot! 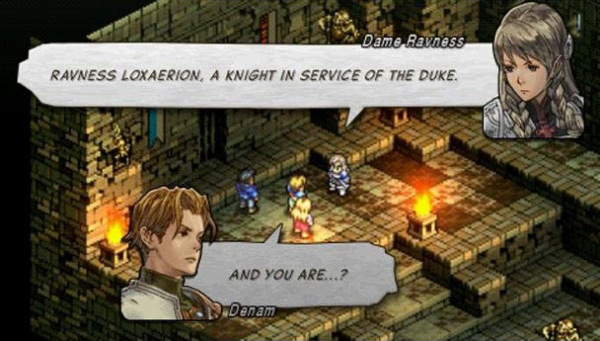 The amount of data that Tactics Ogre packs into the one screen can be overwhelming, especially when in the shop and party screens. 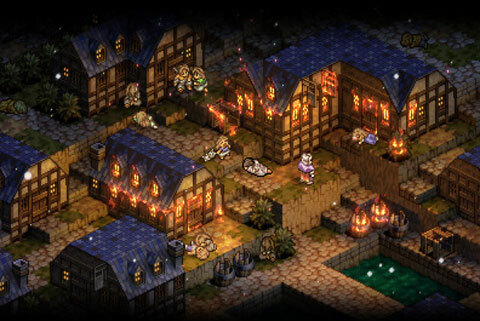 SRPG fans will revel in what they can do, as they tinker with getting their classes, skills and inventories right, crafting items, taming/subduing enemies and auctioning them off, hiring new characters. You can have up to 99 characters in your team and you can micro manage each of them. This leads me to my only gripe. Micro managing the team is seriously time-consuming. When you are at a shop, you only have limited information on who needs what or what magic needs learning. You spend a lot of time going backwards and forwards, out of the shop, into the party and vice-versa. Only certain items apply to certain classes and it would be so much easier to be able to either compare against what someone currently has or equip everyone of the same class at the same time. Final Fantasy : Let’s Cling Together, despite a slightly clunky interface, is a thoroughly enjoyable experience. With a wide arching, controllable storyline, fans of SRPGS in general or patient players who enjoy an enthralling story are ensured many hours of gaming goodness.